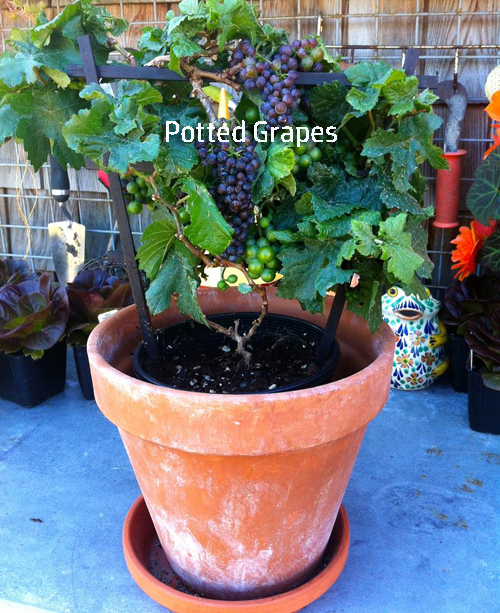 Let's grow some grapes in a garden planter! Doesn't this sound hard? We agree! But, surprisingly if you follow some specific guidelines it's not all that hard at all. This is the perfect project for people with limited patio or porch space. Apartment dwellers, condos or small houses with small yards. Give it a go and see how you do. 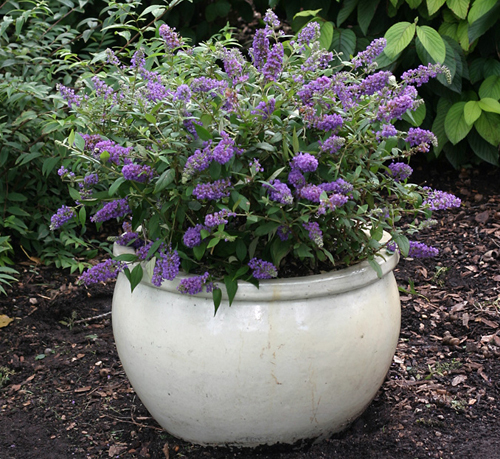 One of the most important things to remember when starting out is to select a nice large and sturdy garden container. This is not the time for starting with a undersized garden planter. On the other hand you don't want the plant to be swimming either. You should shoot for a deep (18 to 24" wide container and 18" to 24" deep. We recommend you use a planter made out of terracotta. This clay pot is meant to breathe and is the healthiest choice for the plants root system. Of course that doesn't mean you can't use glazed, ceramic or concrete planters. They will all work find as long as they are large enough. 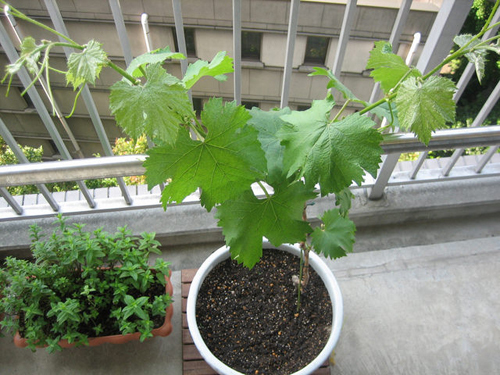 There are many types of grape vines so we recommend asking your local nursery professional what is best for your area. You can go online for lots of information also. 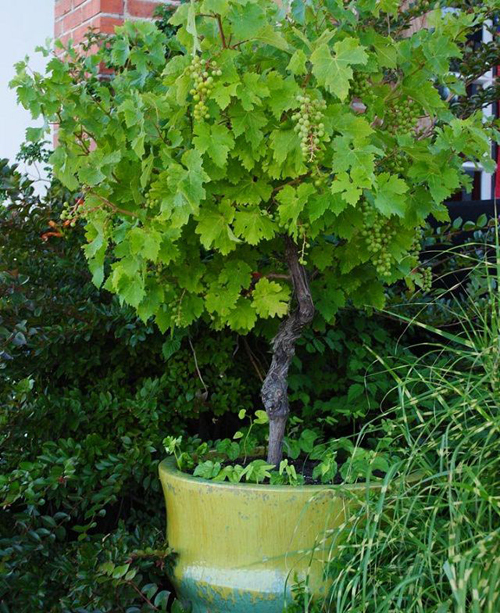 Unless you have the room for a trailing grape vine we recommend you start with a dwarf variety. Plant in spring or summer. Don't use garden soil but instead look for a potting mix that drains well. Mix a good fertilizer into the soil to begin with and use according to the mfg. During the growing season it is best to mulch the top of the garden planter or use a pot topper like garden stone, colored marbles or clay pot broken shards. They will help to keep the moisture from evaporating so fast in the heat. 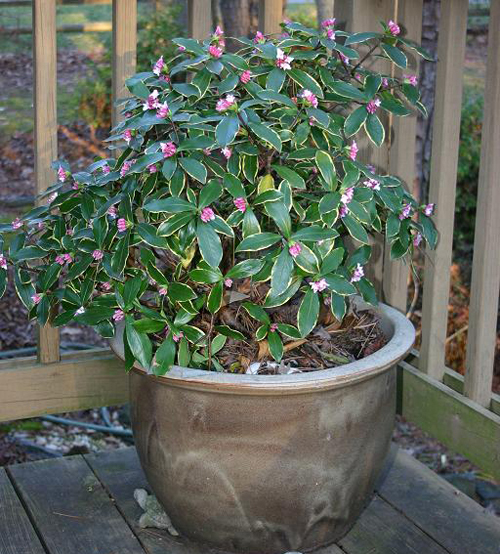 Let the potted plant grow freely and no pruning till late winter. By not pruning you will develop a strong root system. 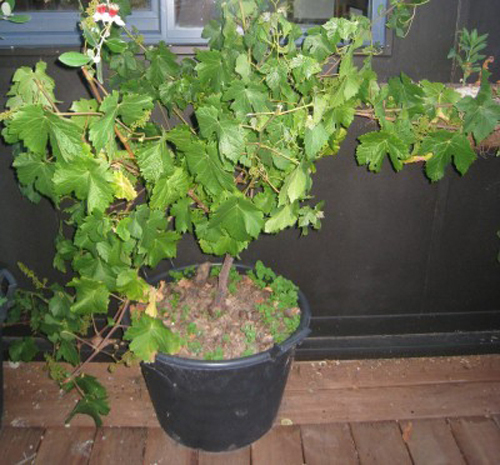 Come winter you should move the potted grape vine into the garage or preferably indoors. Reduce watering and no fertilizer. Give it a go and let us know how it goes. 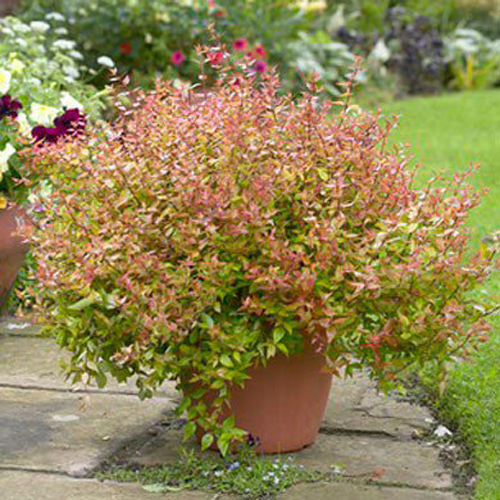 Read More] The best potted shrubs that bloom all year. [Read More] The best container veggies. 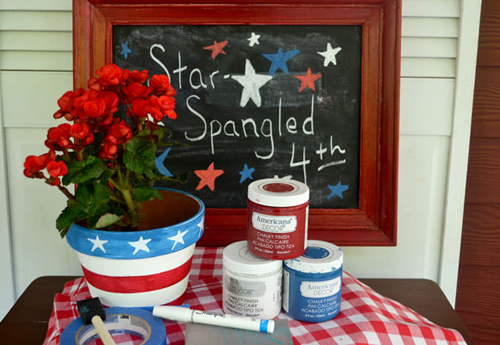 With the 4th of July celebration right around the corner, we wanted to share a few ideas to help your decorate your home or garden area for any parties you may have scheduled. 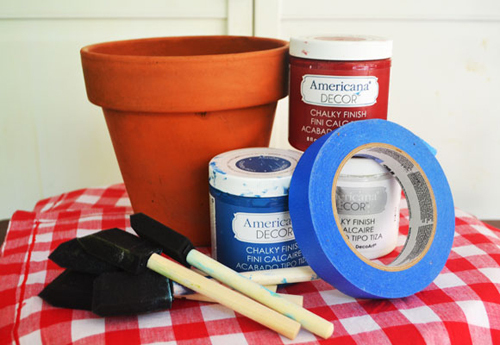 We like to see clay flowerpots use as planters, party favors & more. 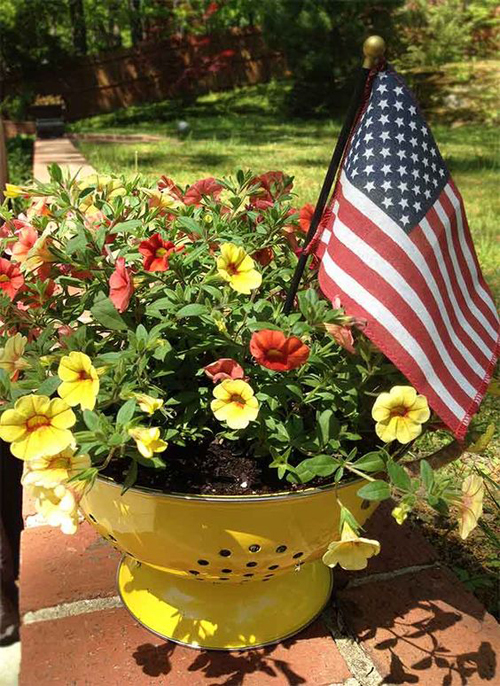 Any kind of garden planter can be used to create fun and patriotic garden decor. Below are some easy and fun crafts and more. A really simple idea. Take some red geraniums and repot them into terracotta clay flower pots. This looks nicer than the plastic nursery pots they come home in. 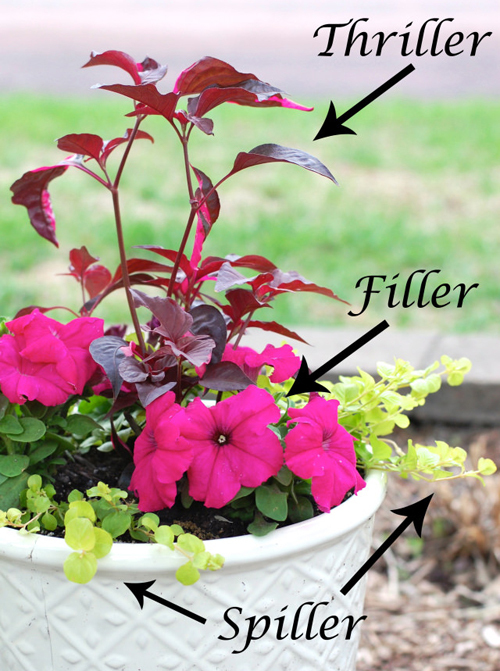 Set the flower pots around your patio or garden area in groups of clusters. This makes the flowers look happier and not as lonely as only one planter all by itself. Take a vintage picnic basket and fill with nursery bought flowers in red, white & blue. Add a few small American flags and some sparkly flower picks and you have created the perfect centerpiece for your patio or porch table. The basket makes a unique & adorable garden planter with hardly any expense. 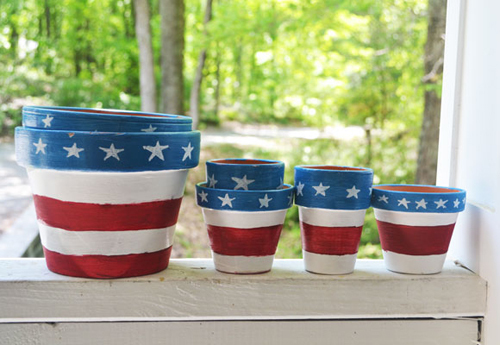 We love seeing recycled items turned into flower pots. 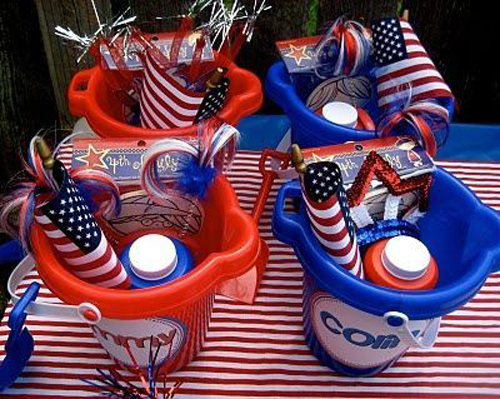 Take plastic buckets, terra cotta clay flower pots or any kind of container and fill with fun items for your party guests. Bubbles, Mini American Flags, head crowns & sparkly bands. This type of party favor is beloved by adults and well as kids. We would add sparklers, charcoal snakes and any other kid friendly fireworks. 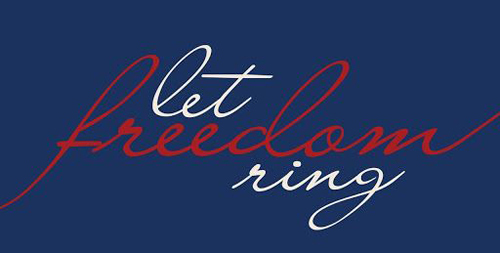 Lastly, we just want to show that you don't always need to decorate for the 4th of July with Red White and Blue colors. Here a kitchen colander has been turned into a wonderful plant container filled with red & yellow flowers. 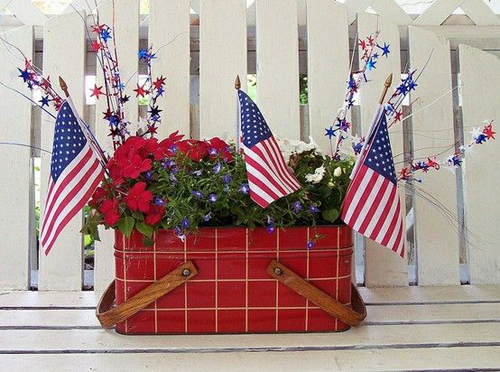 By adding a small American Flag to the planter it makes it look festive & original. 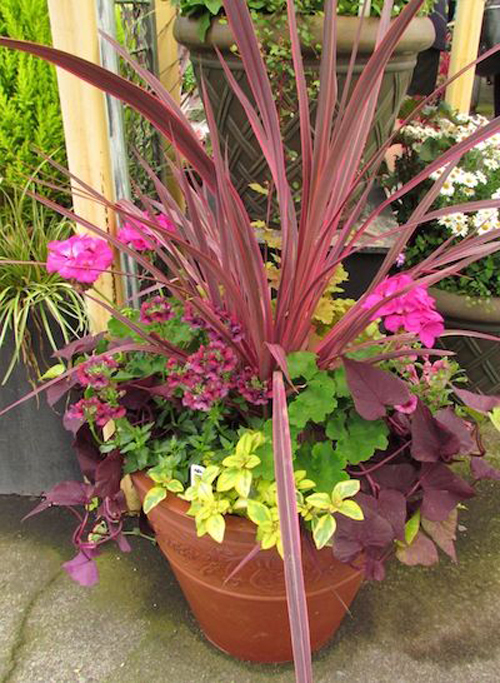 Decorate your porch or patio using the colors of your other landscape items. Just add the flag and it ties it right into the Independence celebration. [Read More] What is your garden style? While searching the web you can find so many great gardening tips. Everything from how to make your own fertilizers, to how to keep animals out of the yard. We have a few of the better ones that we think every gardening should know about because they are so easy and good. Make gardening fun! 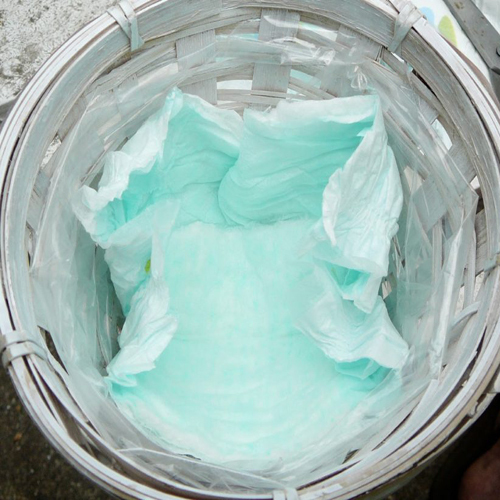 Line the bottom of your garden planters with a disposable clean diaper to help retain soil moisture. This way you save lots of time because you don't have to water nearly as often and the plants have a more even supply of water. The diaper also helps to keep the soil inside the pot and blocks it flowing out the drain hole. These types of diapers container a hydrogel crystal that keeps in moisture. Just be sure and use the cheapest diapers you can find! At the begging of the growing season, select your seeds to potting and have them ready to go. Cut the top off a lemon and carve out the center. Add new potting soil, seeds, fertilizer. 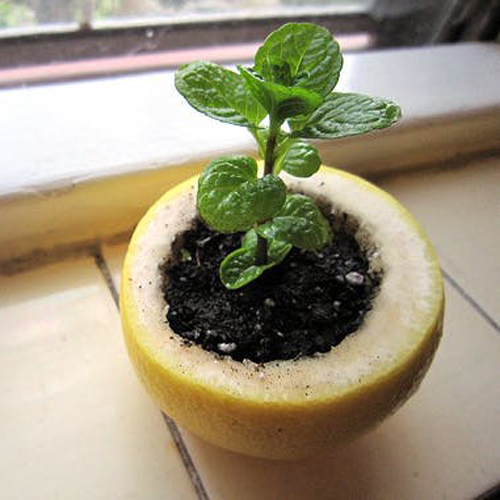 Once seeds start to grow drop the whole lemon into the potting soil inside the garden planter that you are using. This not only makes the process simple but the peel with compost into the soil, adding nutrients and the plants grow. 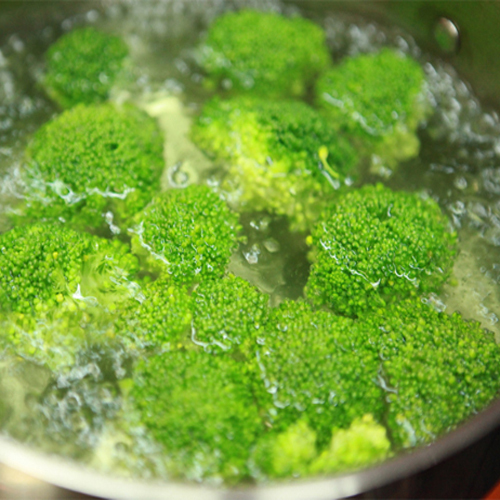 The next time you boil veggies for a meal, don't pour the water down the drain. Instead of wasting all those precious nutrients and minerals, let the water cool and use it to water your potted plants. Of course this water is filled with all kinds of healthy nutrients that the boiled out of the veggies. Your potted plants will love you for it and you can cut down on fertilizer. A double dose of goodness. 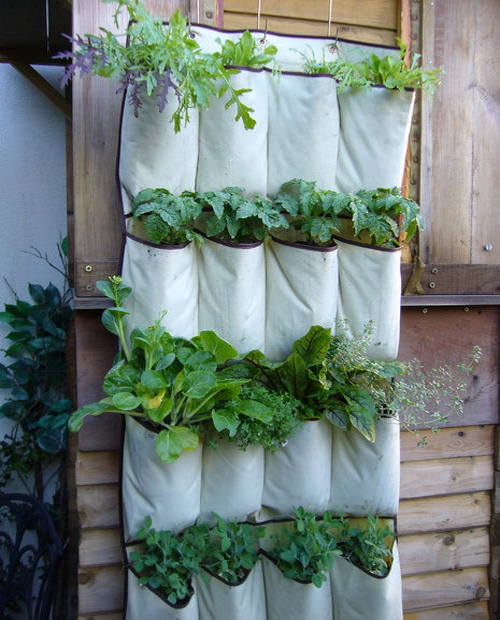 How about using a regular over the door shoe organize and turn it into a vertical herb garden? This idea is so simple and easy to do. Fill the pockets with potting mix and add the herbs. Hang on a balcony wall, a garden fence, an apartment balcony or terrace. Each pocket can be a different herb or you can have rows of each kind. We love this placed next to a kitchen door so that you don't need to go far to clip off a few while preparing a meal. So, if you look there are hundreds of great ideas out there. If you have any you want to share just let us know. Good Gardening! [Read More] The Best Shrubs that bloom all year. You just hit the local nursery and you now find yourself at home staring at some plants, soil and a garden planter. Now what to do to assure you have the best display in your container? Now design. Well here is the big tip - Make sure you have a thriller, spiller and filler. Sounds simple enough right! The thriller is the main, eye catching plant. It usually has some height to it like a grass or spiky plant. You want it shooting out of the garden planter and looking dramatic. Now what is a spiller? Well this is the plant that will drape down the side of the garden planter or yard container. Like a vinica, or ivy. It will spill out over the top of the planter and add interest and depth. You don't not want all your flowering plants and grasses to be just on the top layer. Add some length and another level. Lastly is the filler. 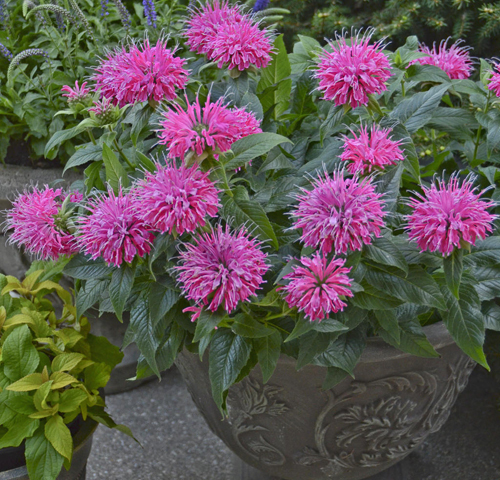 These are the colorful flowers you want to plant that will fill out the pot and give it a dome shape. 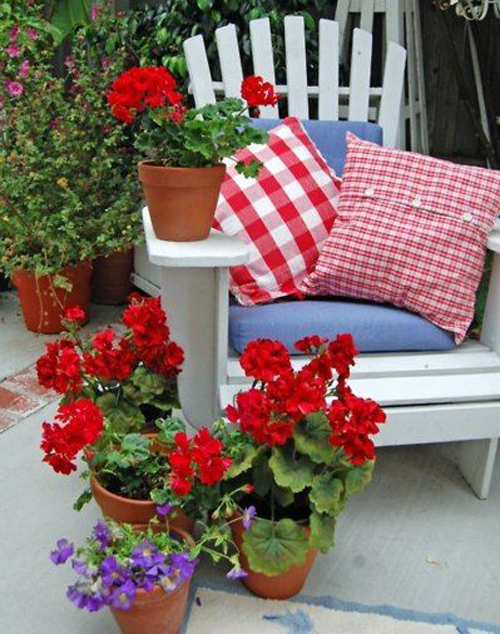 Geraniums are a great choice along with marigolds and verbenas. They last, have lots of color and will fill out your garden planter beautifully. Once you make sure you have all 3 pieces of the container puzzle it's really easy to do. Plant the thriller in the center of the pot. The fillers around the middle pot and the spillers around the outer edge of the container. 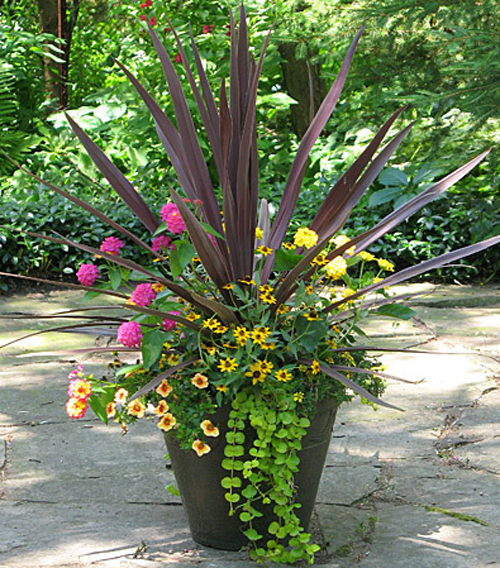 As they grow they will blend beautifully and give you the more stunning flower pot display. 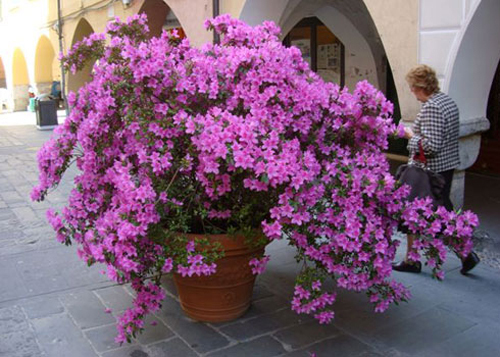 Place on a patio, porch or in a garden area where it can be admired for many months. Good luck!